Detection of intraperitoneal free air is important for the diagnosing of life-threatening conditions in patients with acute abdominal pain. Point-of-care ultrasound is an extension of the clinical examination in patients presenting with acute abdomen. Failure of sonographers to detect intraperitoneal free air was clinically considered as a limitation of abdominal ultrasound. It is now increasingly appreciated that ultrasound may detect intraperitoneal free air. Emergency physicians should be familiar with the sonographic features of intraperitoneal free air which may be essential to recognize bowel perforation. Herein we review the literature on the sonographic findings of intraperitoneal free air and the technical manoeuvres that can improve clinicians' detection of intraperitoneal free air using point-of-care ultrasound. Failure of ultrasound to reveal IFA is considered by many as a weakness of abdominal sonographgy. This is due to the difficulty of differentiating IFA and intraluminal bowel gas. The sonographic features of IFA in the literature are limited. Herein we review the sonographic findings of IFA and technical manoeuvres that can improve clinicians' detection of IFA using point-of-care ultrasound. It is claimed that, sonography is superior to erect chest X-ray in diagnosing IFA and as little as 2 ml of IFA can be detected by ultrasound. , Nevertheless, its detection is difficult even for an experienced sonographer. The sonographic appearance of IFA results from scattering of the ultrasound waves at the interface of soft tissue and air which is accompanied by reverberation of the waves between the transducer and the air. 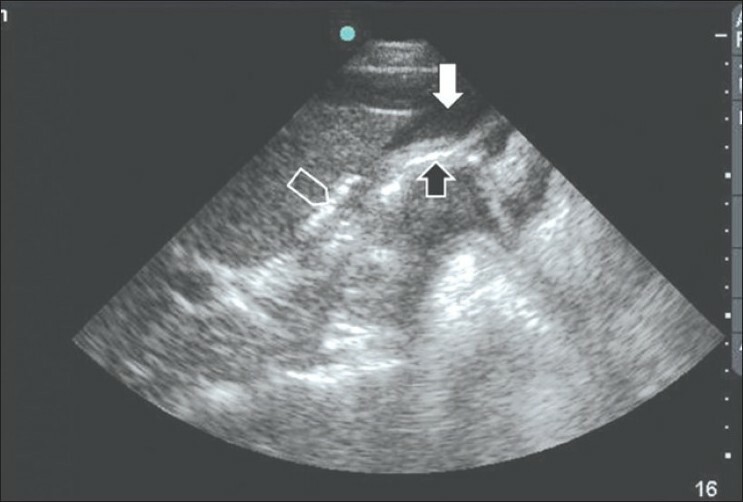 This, typically, results in a high-amplitude linear echo (increased echogenicity of a peritoneal stripe) accompanied by posterior artifactual reverberation echoes with characteristic comet-tail appearance [Figure 1]. , This image can be changed by changing the patient's position. 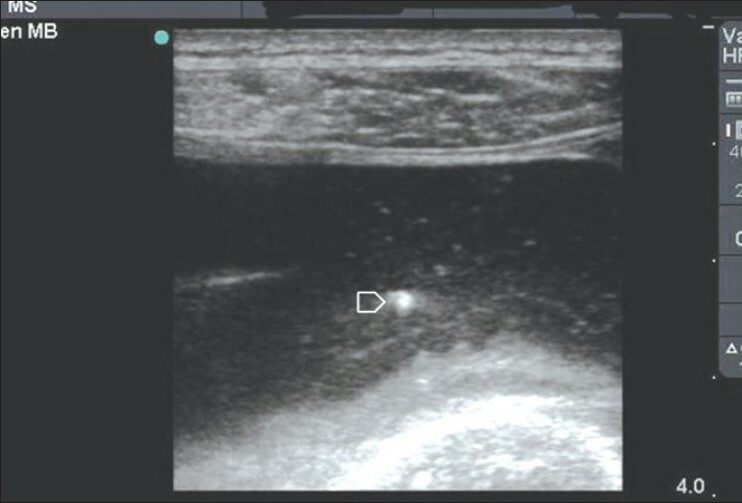 Ultrasound of IFA typically appears as an enhanced peritoneal stripe accompanied by posterior artifactual reverberation echoes with characteristic comet-tail appearance. Right upper quadrant and midline are the best regions to detect IFA. Air in unusual sites should raise the suspicion of a perforated hollow viscus. Emergency physicians performing point-of-care ultrasound should be familiar with the sonographic findings of IFA which has a great value in diagnosing life-threatening conditions. Repeated abdominal scanning of clinically suspected cases of bowel perforation is essential to detect accumulating free air overtime. 1. Jones R. Recognition of pneumoperitoneum using bedside ultrasound in critically ill patients presenting with acute abdominal pain. Am J Emerg Med 2007;25:838-41. 2. Gensburg RS, Wojcik WG, Mehta SD. Vaginally induced pneumoperitoneum during pregnancy. AJR Am J Roentgenol 1988;150:595-6. 3. Chen SC, Wang HP, Chen WJ, Lin FY, Hsu CY, Chang KJ, et al. 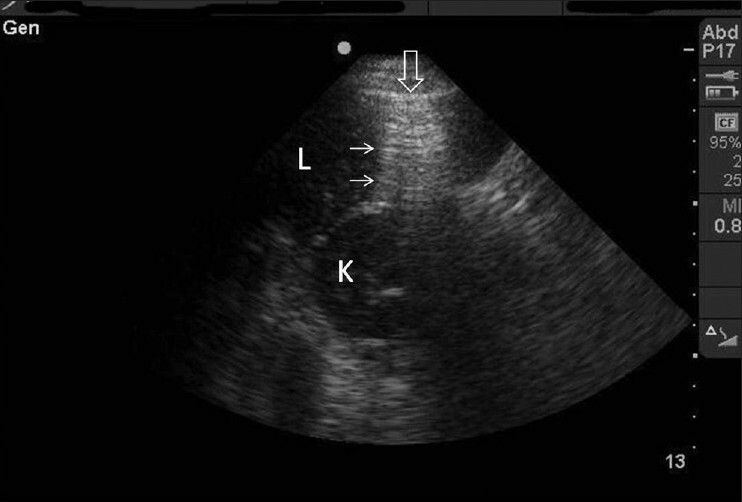 Selective use of ultrasonography for the detection of pneumoperitoneum. Acad Emerg Med 2002;9:643-5. 4. Patel SV, Gopichandran TD. Ultrasound evidence of gas in the fissure for ligamentum teres: A sign of perforated duodenal ulcer. Br J Radiol 1999;72:901-2. 5. Muradali D, Wilson S, Burns PN, Shapiro H, Hope-Simpson D. A specific sign of pneumoperitoneum on sonography: Enhancement of the peritoneal stripe. AJR Am J Roentgenol 1999;173:1257-62. 6. Lee DH, Lim JH, Ko YT, Yoon Y. Sonographic detection of pneumoperitoneum in patients with acute abdomen. AJR Am J Roentgenol 1990;154:107-9. 7. Chadha D, Kedar RP, Malde HM. Sonographic detection of pneumoperitoneum: An experimental and clinical study. Australas Radiol 1993;37:182-5. 8. Blaivas M, Kirkpatrick AW, Rodriguez-Galvez M, Ball CG. Sonographic depiction of intraperitoneal free air. J Trauma 2009;67:675. 9. Pattison P, Jeffrey RB Jr, Mindelzun RE, Sommer FG. Sonography of intraabdominal gas collections. AJR Am J Roentgenol 1997;169:1559-64. 10. García Santos JM. Direct sonographic signs of acute duodenal ulcer. Abdom Imaging 1999;24:226-7. 11. Grassi R, Romano S, Pinto A, Romano L. Gastro-duodenal perforations: Conventional plain film, US and CT findings in 166 consecutive patients. Eur J Radiol 2004;50:30-6. 12. Radwan MM, Abu-Zidan FM. Focussed assessment sonograph trauma (FAST) and CT scan in blunt abdominal trauma: Surgeon's perspective. Afr Health Sci 2006;6:187-90.